Did you ever ask if you need download software or not? And which is the best choice for you? The answer is clear. Most internet users are downloading files (for example; photos, videos, documents and many more). 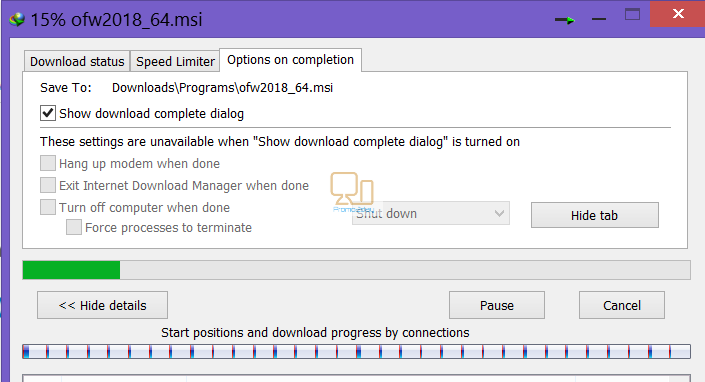 The windows download feature is very slow and crippled. In addition, you need to arrange the files you saved to your computer. Your download may be interrupted and you will try again to save your file. 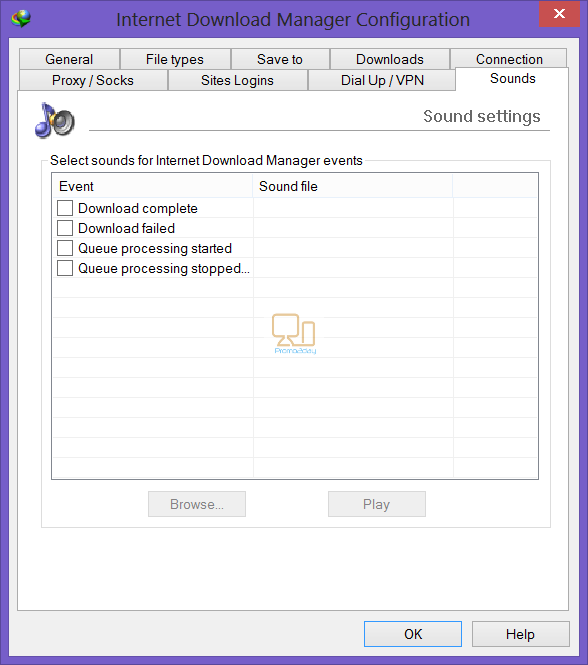 The solution to all these problems is simply using download manager software with many features that can help you. 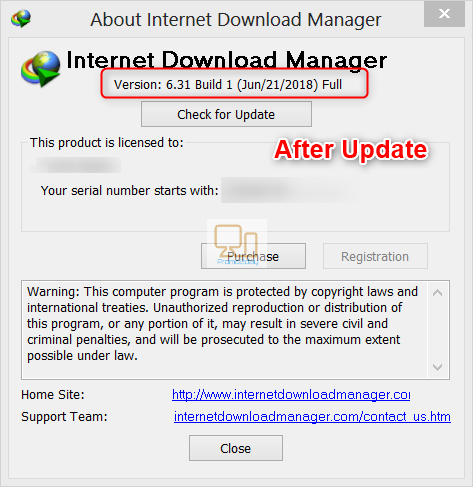 Of course the best solution is Internet Download Manager (IDM) which is one of the most popular programs that is present in most internet user PCs. It increases download speeds by up to 5 times using a smart download logic accelerator that features intelligent dynamic file segmentation and safe multipart downloading technology. It also helps to resume downloads. Comprehensive error recovery and resume capability will restart broken or interrupted downloads due to lost connections, network problems, computer shutdowns, or unexpected power outages. 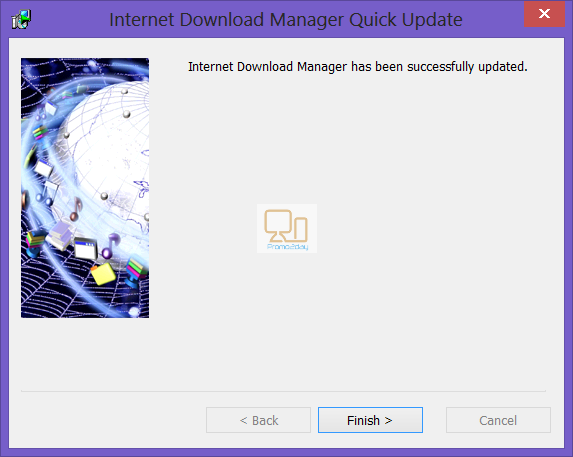 Internet Download Manager has many features that make it the best choice for you. 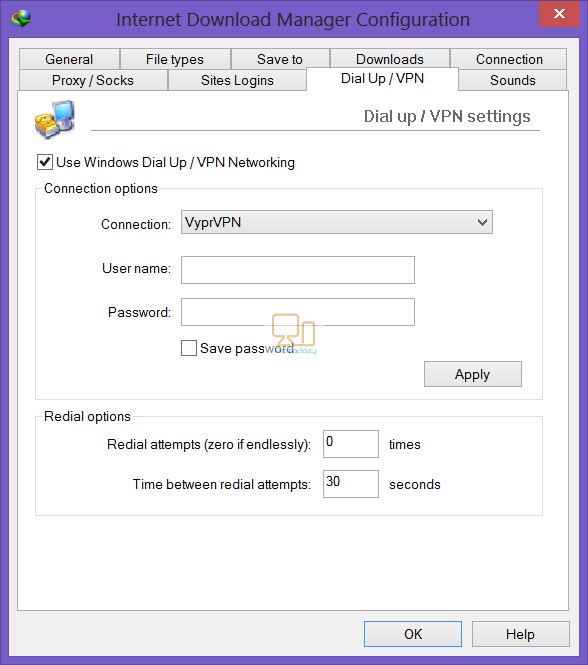 It supports proxy servers, ftp and http protocols, scheduled automatic downloads, firewalls, redirects, cookies, authorization, MP3 audio and MPEG video content processing. Download categories, zip preview, queue processor, enhanced virus protection and multilingual support are other useful tools. You need the first name, last name, email address and serial number (sent to you after purchase). 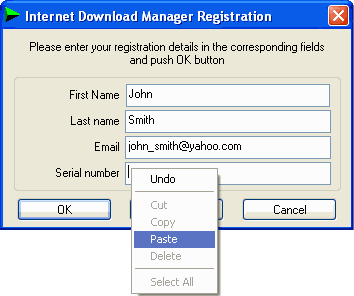 Registered version works for your lifetime and has a number of additional features: no usage limitations, better utilization of bandwidth, built-in download logic optimizer. 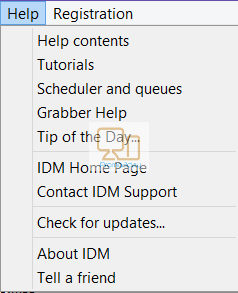 After the purchase you will also get prioritized technical support and the right for FREE upgrade to all new versions of IDM during one year after the registration. 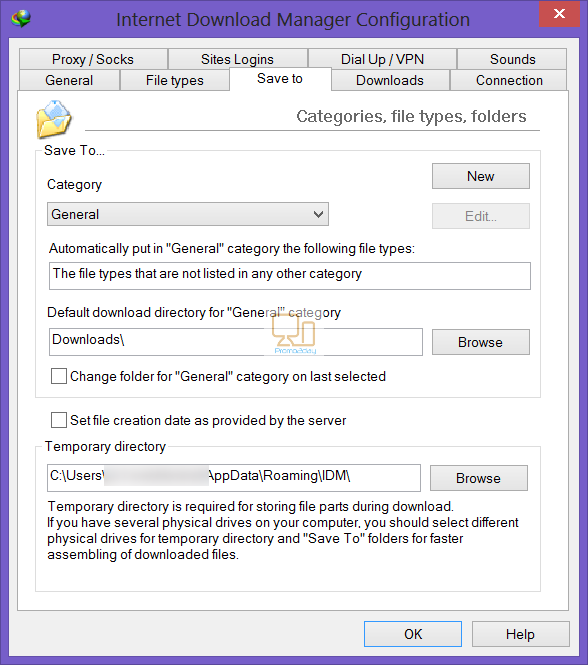 Download categories: These include 5 main categories; compressed, documents, music, programs, video. Files will be automatically saved to any category depending on file type. You can create more categories according to your need. You can also hide it using the option under view menu or close button. 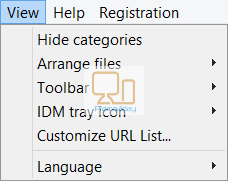 How to customize User Interface and Change language? then browse to IDM root Folder in “C:/Program files”, and extract the contents of the Zip file in language folder , finally restart the program. That’s all! 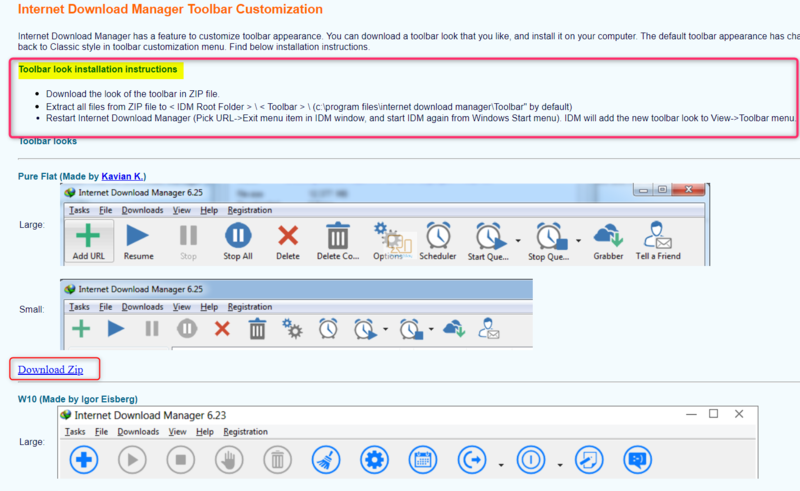 This page is also accessible using “look for new toolbar option” located under toolbar menu. Again, all you need is to download file save and restart your application. 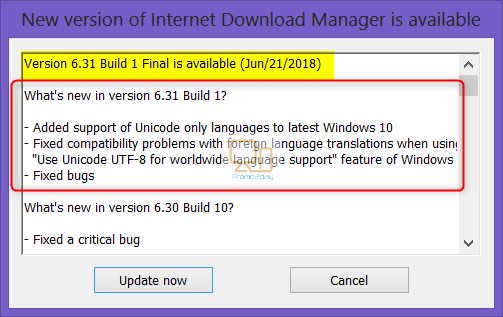 You can check for program updates either manually at any time or automatically when a new version is available. You will receive a notification about the new version and the changes done. 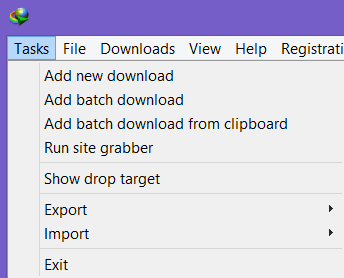 Other methods to start download include drag and drop into the drop target which is accessible through task menu, clipboard download (copy a direct download), command line download for advanced users. Sometimes, the high download speed cause problems if you have slow internet connection or shared with others. 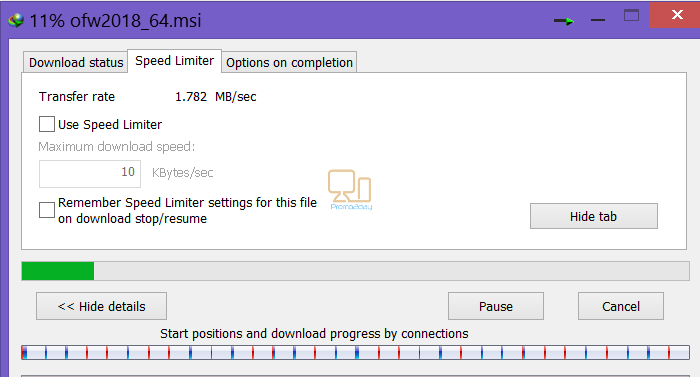 To avoid this problem; the program has a built-in tool to limit the download speed according to your needs. This is located under the download menu. 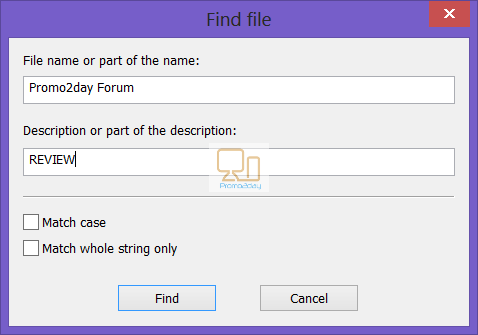 This tool will help you to easily need to find a specific file in the long list of downloaded files. This is located under download menu. This will save your time. This feature lets you save your download list. For example, if you are moving to a new computer or laptop. 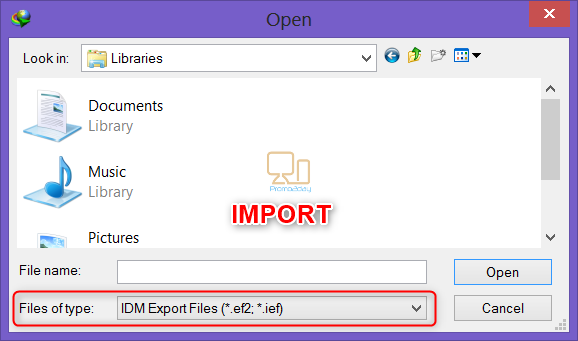 If you want to restore all your download, use import and choose the exported file. 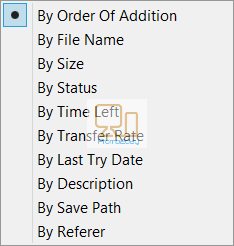 The exported list will be saved on your computer with the extension .ief or ef2. If you prefer to download online videos on hard disk for offline playback, you can use video grabber tool. 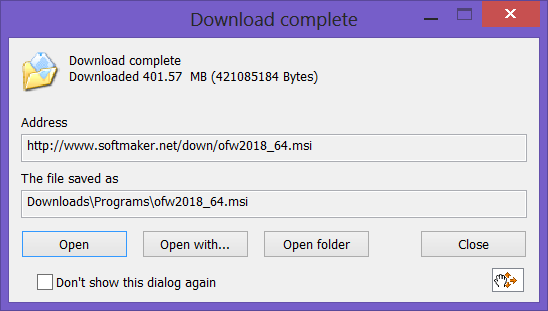 You will see the download panel of IDM above any online video, simply click the panel to see a list of the formats available for download. Select the one you prefer and download as usual. No need to purchase multimedia download software. How to download from a Host File? Many important filesare uploaded to host files (for example rapidgator, nitroflare and many others). These sites require paid subscription to enjoy the full download speed. 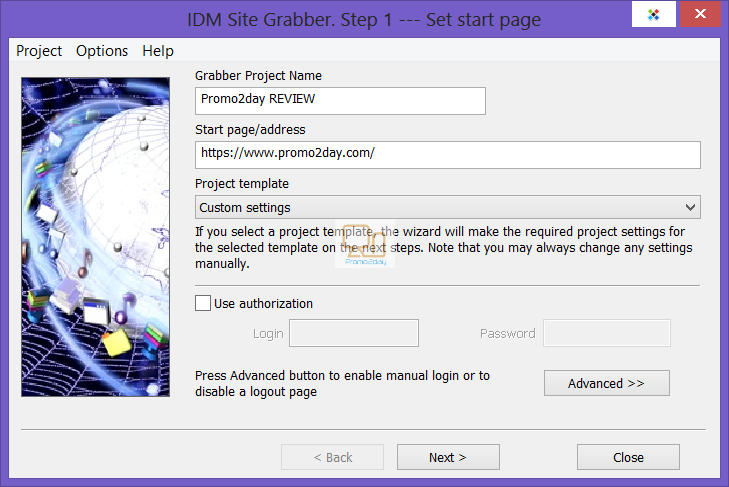 IDM lets you add your host site login details so that file download from that host site will start automatically and with the full speed. 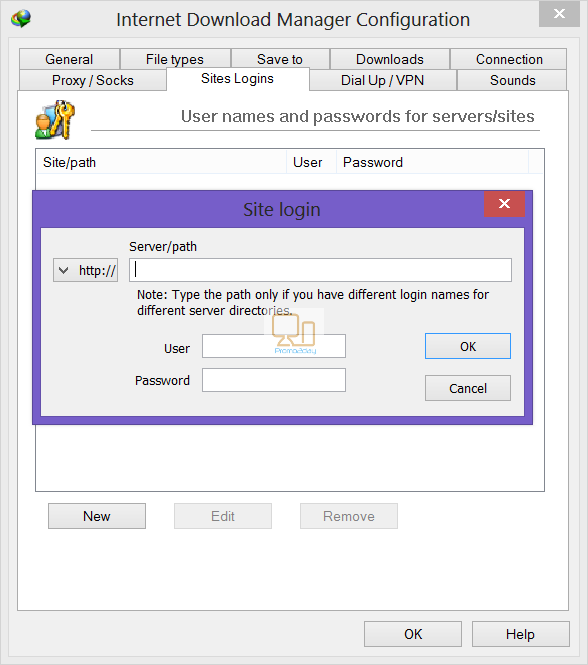 Use sites login under options dialogue to add the site URL , your username and password. That’s all! How to download multiple files at the same time? If there are many files and you want to download all of them, this will need a lot of time and effort. 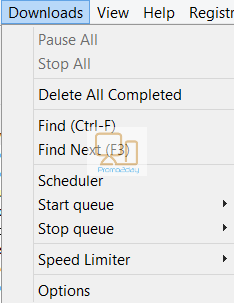 Now, using the built-in batch download feature (in task menu), you can easily download all files with a single mouse click. Simply, add the URL of your preferred website with asterisk then the extension of the files you need to download. (For example *.mp3 for sound files). Last step; you will have to specify the file arrangement method whether numbers (for example from 1 to 100) or letters (from a to z). The program will do everything for you. 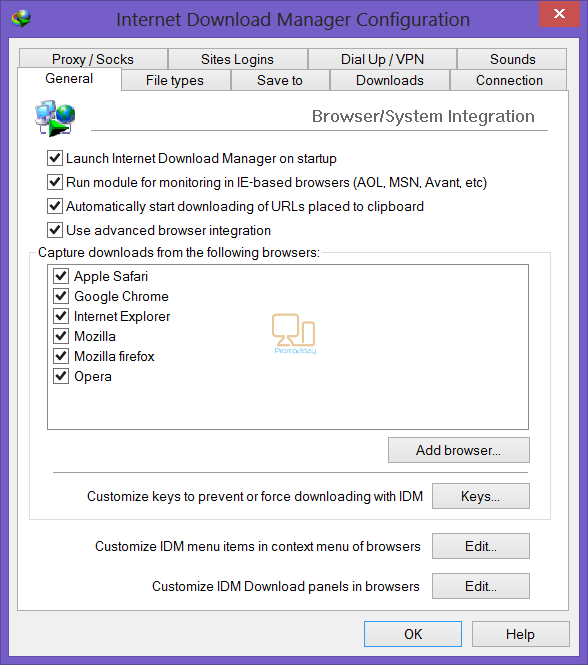 This is a very useful feature that lets you download complete websites for offline browsing. For example, you can download pictures, documents or audio files. 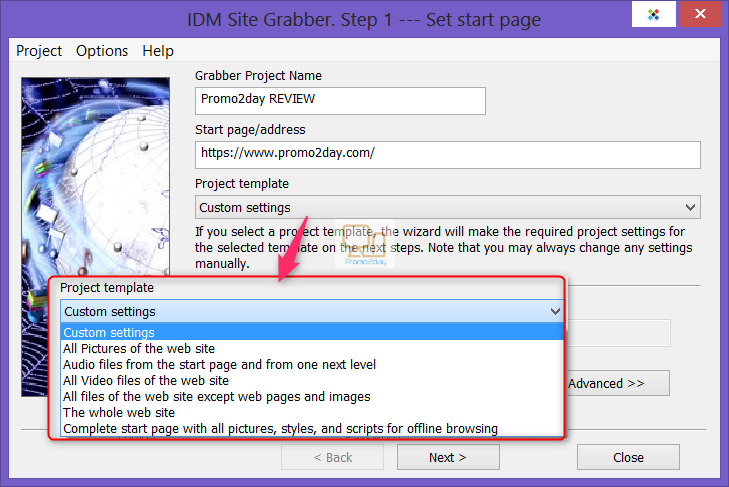 This is a simple four step wizard located under download menu. The first step, you have to specify the name of the new project, the website to be grabbed and project template and authorization (if needed). In the second step, you will choose where to save the project files and some other options such as overwrite existing files, convert links for offline browsing and so on. 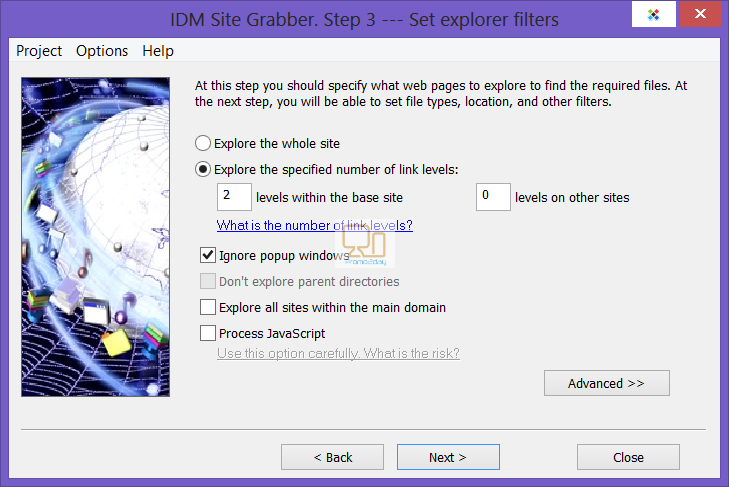 The third step lets you add explorer filters such as website exploration filter levels that will be included. 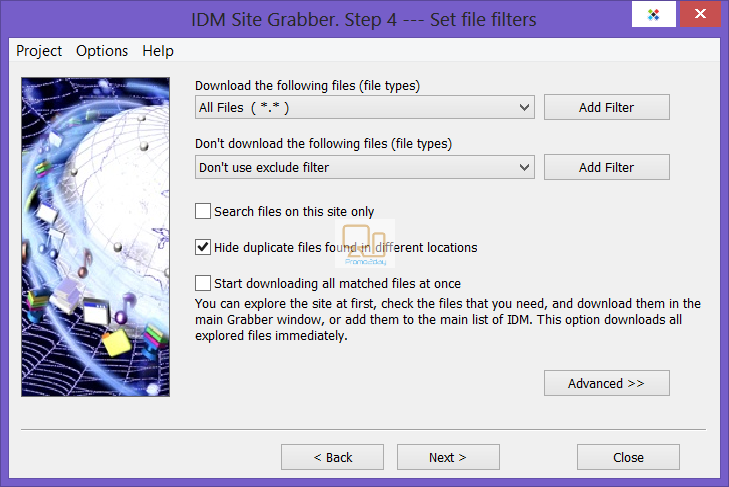 The last step allows you to set file filters (types you want to include or exclude, hide duplicates and many other). Finally, the program will explore the website using the set filters till complete. The progress and statistics can be checked. The process may need long time according to the website and filters chosen. This is a built-in feature that allows to complete all your downloads in an automatic way. It is available as the main and synchronization queues. The synchronization queue is the same as the main download but it checks for any file changes on the server which lets you have the new file version. 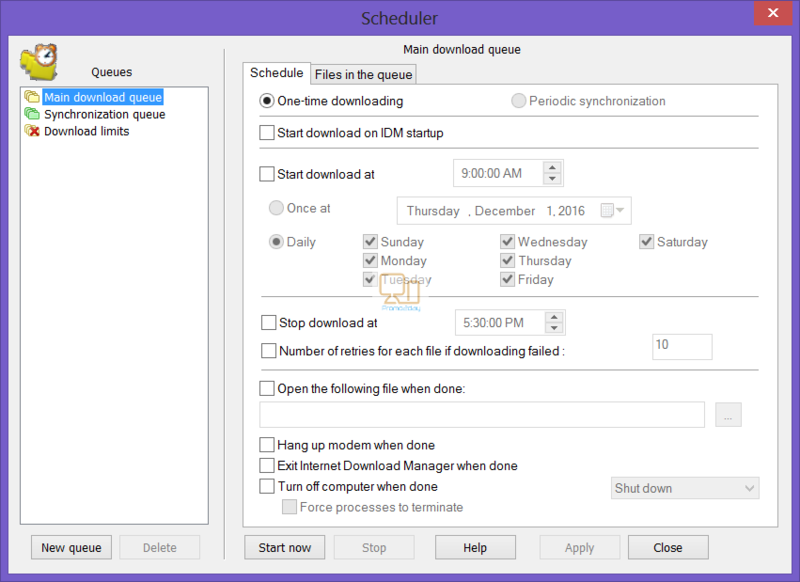 To create a new queue, simply launch the scheduler and use new button then add files using download later option or more easily drag and drop or right click of a file in the download list. 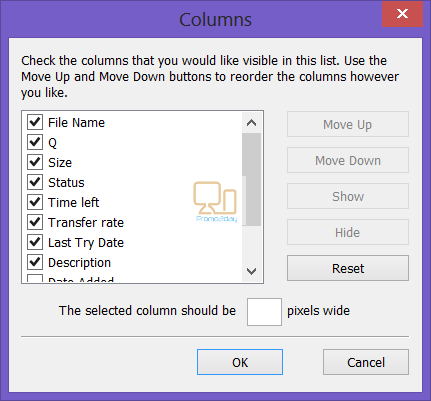 Files will appear as the column “Q”. Finally set location to save files, time to start and end, download limits, number of concurrent downloads. 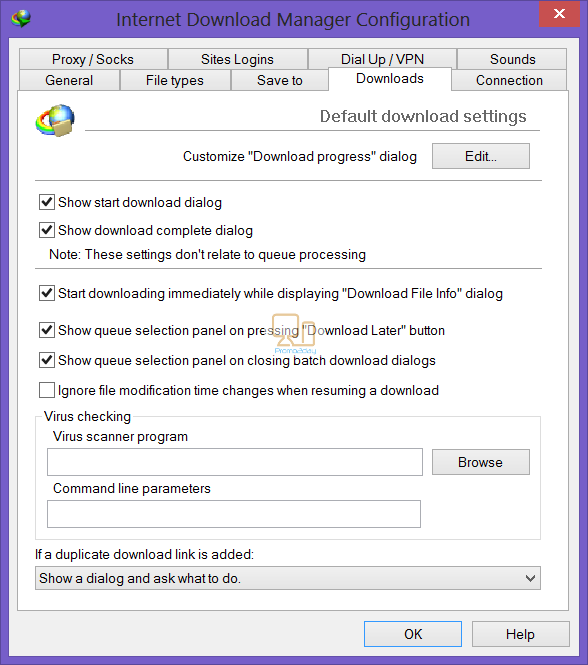 Files automatically downloaded and websites to avoid automatic start of the download process. Connection type and speed (maximum connection number 32). 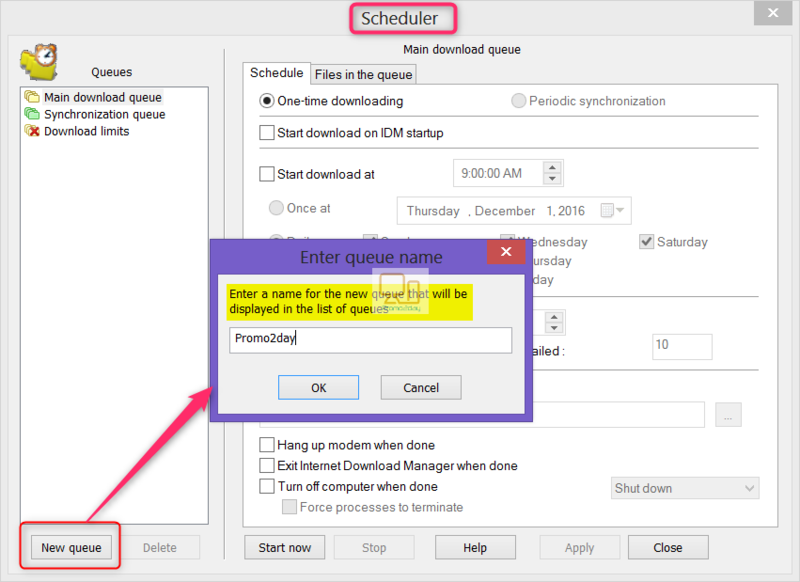 For example with download is completed or failed, queue processing started or stopped. Only “Wav” extension is supported. What are the key benefits you gain from IDM? IDM is the best download manager software with many features and tools, friendly easy to use interface. It is a must have software by any internet user. The program markedly increases download speed and support resume of broken links. It has built-in site grabber tool, scheduled automatic download and video grabber tool which lets you enjoy offline playback of your favorite videos. The program supports all browsers. You can use it with file host sites.